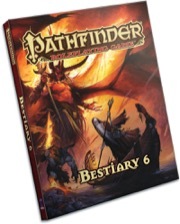 With the reveal of Pathfinder RPG: Bestiary 6's fiendishly ferocious cover last week, the time is finally right to start looking INSIDE of this book... or should I say the STARS are right? Because yes indeed we've got three more of Lovecraft's Great Old Ones appearing in this book. In fact, one of the recurring themes you'll notice right away (it's right there on the cover) is that we're including more statistics for demigods in Bestiary 6 than any other bestiary we've done. Now, obviously a stat block for a creature of CR 26 to CR 30 in power isn't going to be useful for every game, but that's not the only way to use a demigod in your game. These are foes not only intended to be the end bosses for full-on mythic campaigns, but movers and shakers for multiple campaigns. Demigods work best when they're NOT just stacks of hit points for your players to deplete... but printing statistics for them helps to quantify in a player's mind just how powerful they really are. In addition, each demigod entry is fully supported with rules for how their worshipers function, including information on cleric domains, subdomains, and favored weapons. We've also added a new appendix to this bestiary at the very end that reprints several domains and subdomains that have never before been printed in the RPG line, making it easier than ever to play a character who wants to use powers from the Scalykind domain or the Revelry subdomain, for example. But enough about that. The point of this blog (and the next several to come over the following weeks) is to show off some art! In Bestiary 6, we've got 4 categories of demigod represented—archdevils, empyreal lords, Great Old Ones, and the Horsemen of the Apocalypse. We've also got representation from the next tier down—so called "quasi deities" like qlippoth lords or the verdant Green Man. I've chosen three of these to illustrate below, focusing on new illustrations for each: the archdevil Baalzebul, the aforementioned Green Man (of which there are multiples—some neutral, some good, and some evil), and Tawil at'Umr. "If Tawil at'Umr is killed, Yog-Sothoth can create a new avatar immediately. The replacement Tawil at'Umr typically does not reappear where it was killed, and it usually does not seek revenge against those who slew its predecessor. Usually." I just started reading this article and there's already a completely new information: new domains and subdomains are in this book, and they will be in the PRD as well! This is going to be a delicious book. That art of Tawil at'Umr looks like a heavy metal album cover. I am so cool with this. My planar setting use demi-god stats (and mythic creatures with the divine source power) as the gods, and have a very physical presence in my group's adventures so more will be very useful. Don't know about the Green Man. 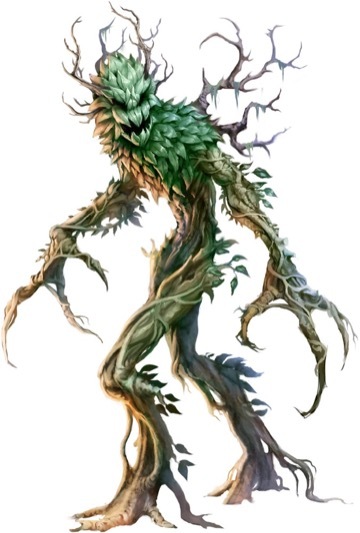 Looks like a variation of the Treant. Guess I was looking for something more out there. Hot damn those Green men sound exciting. I'm also excited to see some empyreal lords. Here's hoping they're here to show the bestiary 4 dudes what good demigods can really do :P.
So how about those Qlippoth Lords? I've been designing a bunch myself for a third-party bestiary and would love to see how your interpretations of eternal chaos entities compare to mine. This is absolutely amazing. Its not even how Lovecraftian it feels to know that anything that happened was literally for naught—that line itself has incredible narrative to it. Interesting that it doesn't repeat the "typically", which to my mind would be even worse ... you've invested and sacrificed so much to defeat this thing, and now it's back right in front of you and IT DOESN'T EVEN CARE THAT YOU KILLED IT. This is the first time I'm looking forward to the sixth volume of monsters for a game system. ...how many have there been? The wording would suggest a wider outlook - I'm just not sure how many other systems went that deep. Multiple types of the green man sounds interesting. It is a shame that the Qlippoth Lords are not full on demi-gods. Chronicles of Darkness has like eight monster books I think, they're nowhere near the quality of the bestiaries though. 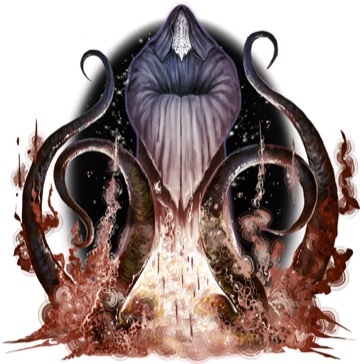 Is Yog-Sothoth an Outer God or a Great Old One? As in the acronym for, Yup, Outer God. So, what does 'Tamr at'Uwil translate to in English, anyway? More or less, as far as I know... "The Prolonged of Life." Cool! I'm very curious about the Green Men. Stated for years now that they were less powerful, that some powerful qlippoths turned stag and became demon lords, etc. They've drawn a fairly clear distinction between the obyrith work for 3.5 (where the oby lords mixed freely, were originally more powerful than the demons, etc) and qlippoth (which follows closer to the Green Ronin version, in that the qlippoth were horrific, terrible, and all but wiped out by the demons) for PF. It's fairly cool, since they're the original authors of all three, that they've made them distinct in that manner. But qlippoth lords being quasipowers and no current demilevel qlippoth has been the running narrative for quite some time now. If anything, undermining that canon without explanation would be the real shame. Hopefully next week will be about the new dragons, the kaiju, and/or new 0HD races. "In addition, each demigod entry is fully supported with rules for how their worshipers function[...]"
And given [url]who's going to be showing up[/url], it's fairly safe to say I'm extremely excited. "These are foes not only intended to be the end bosses for full-on mythic campaigns, but movers and shakers for multiple campaigns." Will there be advice on how to apply this?! We have a precise number for the demigod categories in the book, four of them. But what about the quasi-deities? Are there others excluding the ones you mentioned? Yog-Sothoth might just be my favorite Outer God... so I'm jazzed beyond words to see his lesser incarnation get statted up. And so artfully... er... arted. If Tawil at'Umr is killed, Yog-Sothoth can create a new avatar immediately. The replacement Tawil at'Umr typically does not reappear where it was killed, and it usually does not seek revenge against those who slew its predecessor. Usually. There's something magical about a stat blocks that's a joy to read on their own merits, like this one. The usually thing reminds me of how some creatures have interesting names for their collective nouns, like a group of lead golems being a curtain so it's a lead curtain or too much animate hair is called a clog, more than two devastator's is a catastrophe. Apart from the brief advice I wrote for the intro for Demon Lords in Bestiary 4, not really... although you can look to some of our Adventure Paths for how to include demigods as plots. Tangent: a group of giraffes is called a tower. Certainly better than he did in the Book of Vile Darkness. Of the archdevils, I'm most interested to see Moloch's art, if only because it's going to be so hard to top his Book of the Damned art. What wives? I didn't see them in any artwork. And given who's going to be showing up, it's fairly safe to say I'm extremely excited. You mean "stop the ritual," or "debuff the enemy?" That...doesn't really say "mover and shaker." Also, given the inclusion of a certain empyreal lord, I'm interested in seeing demigods as allies as well as antagonists. It's gonna be a while before Daily Bestiary gets to them, and Daily Planescape just isn't enough. That said, would Wrath of the Righteous be a good place for examples of demigods as allies? That's the first unfriendly-looking green man that I have ever seen. I just hope the green man is actually a fey. Turns out he's a dragon. Tawil at'Umr is pretty awesome for a number of things, ranging from that artwork to setting a precedent for what divine avatars are actually like. Through I would love quasi-deity level dragons, I'm hoping they are plants. The green nature needs more champions and denizens. This interests me. Do you happen to remember where I could find this? Thanks.